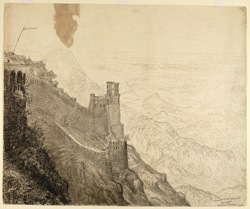 Pen-and-ink and wash drawing by Philip Meadows Taylor (1808-1876) of a view from Gawilgarh in Berar, Maharashtra, dated 1837. The image is inscribed on the front in ink: 'Tower over the Peer Putteh Gate. Gawilgurh. Looking towards Ellichpoor.' On the back is an unfinished sketch. The hill fortress at Gawilgarh, built by Ahmad Shah I of the Brahmani Dynasty in the 1420's, was held by the Nizam and the Marathas, before being captured by Colonel Arthur Wellesley in 1803, during the Second Maratha War. Taylor spent a large part of his career in India in the service of the Nizam of Hyderabad, in the role of soldier, adminstrator, Superintendant of Bazaars and Assistant Superintendant of Police for the southwestern districts of Hyderabad.